Sagrantino vineyards in the fall in Montefalco at the Roberto di Filippo estate. Sagrantino, a thick-skinned grape with off-the-scale color and body is where you find the red prize of Umbria. Montefalco is perched high up in Umbria, in the foothills of the Central Italian Apennines. These lush, green hills are the historic home of Sagrantino yet it’s not well known outside of Umbria. Say Italy and wine in a sentence and many likely gravitate to Tuscany and Piemonte, and the Sangiovese and Nebbiolo grapes. And many travel to these wine regions too, staying in northern Italy. Lucky me the Italian Food, Wine and Travel group decided to head down to Umbria! The only land-locked region in central and southern Italy is Umbria. It’s also the least populated and hilliest- 71% of the terrain is rolling with verdent hills. Having this position almost smack in the middle of the Italian peninsula means the area offers variety. And it’s easy to get to from Tuscany. It offers water; the largest lake (Trasimeno) and the longest river (the Tiber) are in central Italy for boating, canoeing, and kayaking. Amazing cycling, archaeological riches, (museums and ruins), UNESCO sites, and of course food and wine are plenty including black truffles! The climate is varied too. Both Mediterranean and continental areas, something exists for all tastes. Variety gives life flavors and they both ooze from Umbria! The Perugia province is known for chocolate, I’m told visiting a historic chocolatier is a must… and a nice pairing with Montefalco Sagrantino Passito, a dessert style wine. In this less known region of hills and mountains you find several appellations and indigenous grapes. Historically the most popular is Orvieto. Made from the Grechetto di Orvieto and/or Grechetto di Todi grapes (two unrelated grapes that unfortunate for consumers, is referred to as the same and often not distinguished), swift success led to increased volume and exports. Like almond and soy milk everyone wants in on it, production swells and quality teeters. Instead of quality wine, Orvieto exports got the cheap, bulk wine rap. But producers are now making lovely Orvietto. You just have to ask a skilled wine merchant. Umbria and more specifically Montefalco is where Sagrantino calls home. 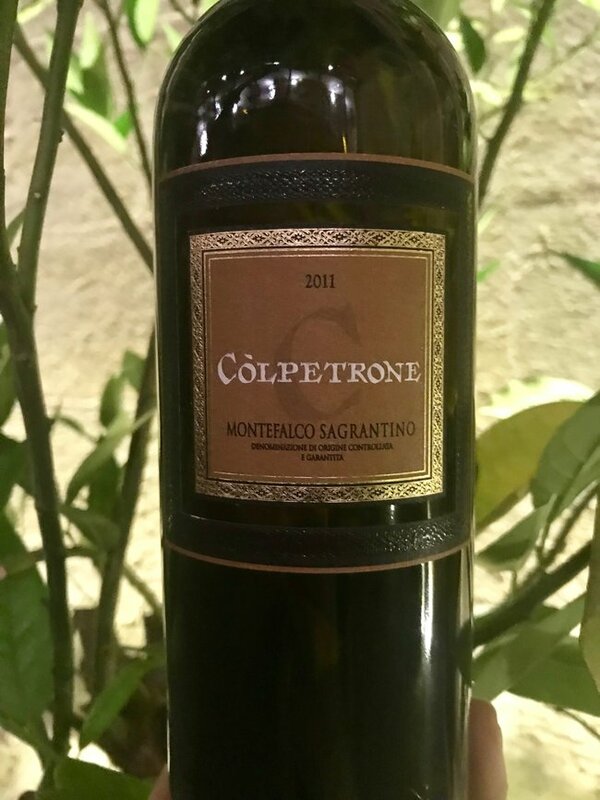 A longtime component in Montefalco Rosso DOC wines, winemakers coaxed such character from the grape as a stand-alone wine it received its own appellation in 1992: Montefalco Sagrantino DOCG for dry and Montefalco Sagrantino Passito DOCG for the historic sacramental sweet wine. It challenges Nebbiolo (Barolo) and Aglianico (the Barolo of the south) for the fullest-bodied, most powerful wine in Italy. And it produces delicately aromatic, beautifully balanced wines that can age as well or longer. Historically used for passito due to its strong character and high tannins, this very old grape also added color, aromas, body and alcohol to other wines thus was included in blends. The DOC wine Montefalco Rosso must contain ten to twenty-five percent Sagrantino, the remainder is Sangiovese. It’s the choice for the “governo” method whereby a small amount of semi-dried Sagrantino grapes are added to other freshly vinified wine. This initiates fermentation producing a richer, rounder, approachable wine… and helps to tame Sagrantino’s tannins! Now days the Sagrantino grape is also grown in McLarenvale and Barossa (Australia), Dry Creek Valley (Sonoma), and Sicily. 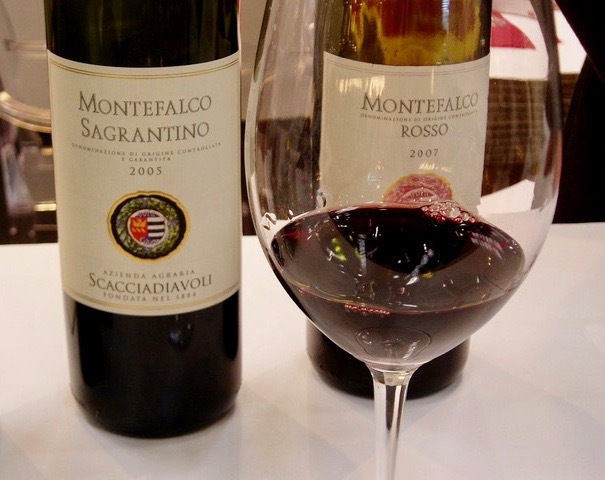 If You Like Barolo and Big Cabernets, There’s A Reason To Try Montefalco Sagrantino! If you’re fond of Barolo and big Cabs, Austrailian Shiraz and northern Rhone Cornas, you’ll want to add Sagrantino to your list. The grape produces full, big wines with ample tannins that in the hands of skilled winemakers, develop beautifully. By law the wine requires thirty months of aging before release. And more time in bottle is better. Sagrantino is a big wine. You may want to decanting it and let it sit a bit to open up. In the glass it classically presents violets and blackberries surrounded by earthy components, medium acid, a rich, round and full body, and medium to very high tannins. Mark and I enjoy Sagrantino especially in cooler months as it pairs nicely with heartier foods. Of particular note is its affordability. Sure some have a higher price tag but many, both released ready to drink or for aging, are very affordable (less than $50). Here are a few Montefalco Sagrantino DOCG to try, both our, and recommendations from others in the wine world. Còlpetrone is widely available in the States and a nice example of an approachable Sagrantino at a younger age. It’s has a rustic quality but is softer, not as brawny as some. From the Tenute del Cerro wine company. From one of the oldest properties in Montefalco. Scacciadiavoli gets a triple vote! Mike Madaio, Italian Wine Ambassador with the VinItaly International Academy, is also a fan. According to Mike, “It still features all the typical brawny, tannic Sagrantino character, it also tends to showcase the grape’s more elegant, balanced side as well. This makes it a good pick for younger drinking (5 years old) and allows more versatility with food pairings. It’s also quite well-priced around $30.” Mikes wine writing outlet is Life at Table. 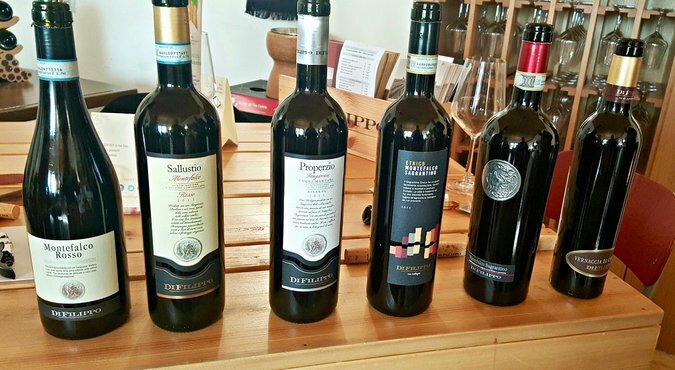 Katarina Andersson, Sommelier, Social Media Strategist and the woman behind Grapevine Adventures visited the di Filippo winery last year. She tasted several wines including the 100% Sagrantino but she recommends all of them! The Montefalco Sagrantino is the fifth wine from the right. di Filippo is an organic producer practicing biodynamic principles. 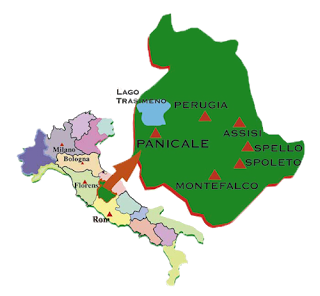 Scroll down for more information about the MonteFalco appellations, and facts about the region! Saturday, February 2nd at 11am ET / 17:00 in Italy our group of writers chat about all things Umbria. You can read about the group and how to participate from Jeff Burrows at foodwineclick, our host this month. Join our chat using the hashtag #ItalianFWT. This is an association that promotes Montefalco wines and tourism in the area’s five villages: Montefalco, Bevagna, Giano dell ‘Umbria, Gualdo Cattaneo and Castel Ritaldi. They organize a variety of themed activities throughout the year. Their website has extensive information about the wine and visiting the region. Italy’s hilliest area (71% of terrain), the remainder is mountainous. International grapes are allowed in Umbria but native and traditional varieties have the upper hand (about 80%). The top five grapes (60% of production): Sangiovese, (most planted), Trebbiano Toscana, Grechetto (di Orvieto and Todi), Sagrantino, and Merlot. Trebbiano Toscana is called Procanico in Orvieto. Several grapes in Italy are called Trebbiano something. They might share some characteristics but aren’t related and must be considered separate varieties. Trebbiano Spoletino is only found in Umbria producing refreshingly acidic wines. Grechetto di Orvieto and di Todi are two distinct varieties but often not distinguished, and considered the same at one time. Any wine labeled “Grechetto” may be a blend of the two. Grechetto di Orvieto produces light, citrusy, delicately aromatic, ample acidity. Suitable for late harvest and botrytized wines due to thick skin. Grechetto di Todi (identical to Pignoletto in Emilia-Romagnia) high tannin content in skin produces fuller-bodies wines. IGT wine is 40+%, DOC/DOCG is 33%, the remaining wine is generic without origin. Wine is almost equally divided between red, white and rosé. The “governo” method is sometimes used with the Montefalco Rosso DOC blend (discussed above). Wine Guy Gavin Hubble has a nice description of the process here. Just two provinces: Perugia and Terni. Montefalco is one of the continental climate areas in Umbria where it often snows. The region as a whole is either Mediterranean (more west) or continental. Rosso and Rosso Reserva: Sangiovese plus other approved grapes and ten to 25% Sagrantino; minimum of 18 months aging, reserva ages 30 months with twelve in oak . Aging 37 months total, twelve in oak. Montefalco DOC and DOCG occupy the same area. Sometimes “secco” is included on the label to distinguish it from the historic passito style. Made via the appassimiento process where grapes are dehydrated indoors on graticci (mats). Aging requirements are the same as secco but oak is optional. Copyright Notice: This site is Copyrighted 2010-2019. All Rights Reserved. No unauthorized copying of anything on this site is permitted. If you wish to use any part of this site, contact me. For information on Copyright Law, see the official U.S. Copyright Office page. Thanks for the GREAT post! I can’t wait to explore more bottles of Sagrantino. I just need to find some! I’m with you on that Camilla! Love this essay! Your headline grabbed me right away. Your intro smacked me in the face – just like that cake my wife splattered on my face at my wedding. I had to keep reading… and glad I did. 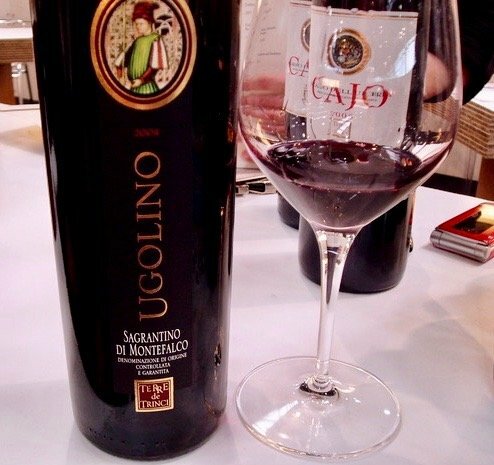 I’ll be heading to my local wine spot this weekend to find me some Umbrian Sagrantino! Thanks John! And know that some Sagrantino will smack you in the face with a beautiful, big body and tannins worthy of grilled beef, lamb and such related dishes. Hoping you find some where you live. I was recently in an area of Florida and couldn’t find a 100% Sagrantino. Thanks for providing such a thorough primer on Sagrantino – and suggesting a variety of great wines to try. Now my challenge will be to track them down here in the States. For today’s chat I was able to find one bottle. Maybe online offerings are better. In any case I’m on the hunt! Lots of great info and I love the map that shows where Umbria is. And so close to Tuscany. I’ll be encouraging friends heading there to make a trip to Umbria too! Great article and insight to sagrantino and the region as a whole. 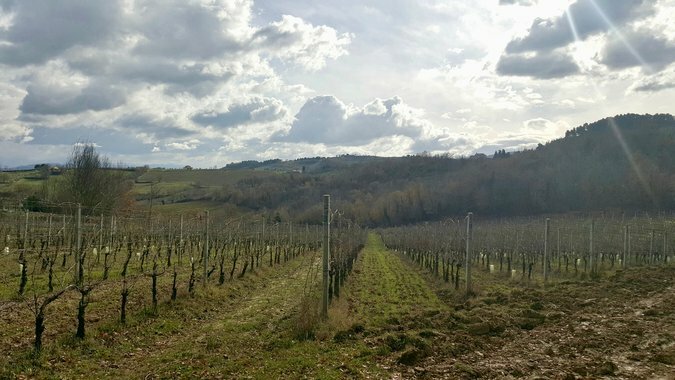 What a wonderful post on Umbria, Sagrantino and even the past history of Oriveto. You really put a lot into this post. I love the way you incorporate other people into your post as well. That’s very unconventional and interesting. I may take a leaf from you. I also agree that this wine can rival some of the others considered the big reds of Italy – Barolo, Agliaoico and Sangiovese. Thanks for your comment Susannah! I’m excited about Umbria and what it has to offer. I like directing people to information on other sites. There is a lot of great info out there so why not share! Thanks for all the great info packed into your post, I hope to get to Umbria sometime and will take advantage. It is kind of fun to compare the other tannic wines from Italy. My view is that Sagrantino and Aglianico are more closely aligned being just plain big. Iron fist in an iron glove. For me, Nebbiolo still stays light on its’ feet, even with all that structure. I think you’ve had more Barolo than me so thanks for that comment Jeff! Perhaps also comparing it to a big Calif Cab or Bordeaux. I’ve had some Bordeaux that practically rip your face off with all the tannins. A great round up on the wines of Umbria! So much great information here. After this month, I definitely think I’ll be searching them out more often. Couldn’t agree with you more Nicole. And in fact, I’d love to visit the region too.